DQGrandstaircase Delta Queen Steamboat CompanyCo. 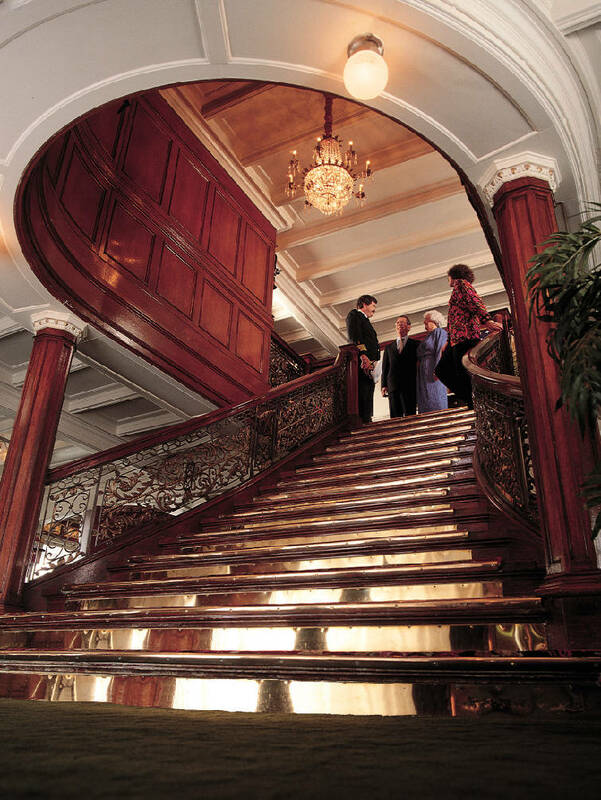 The grand staircase aboard the Delta Queen, with its hand-crafted wood and crystal chandelier, harkens back to the golden age of boat travel. The Delta Queen may finally sail again after a decade at dock. The historic steamship did duty as a floating boutique hotel in Chattanooga's Coolidge Park from 2009 to 2015. Then it was towed away in 2015 to a canal in Houma, La., — where it still sits — after high winter Tennessee River water levels on several occasions submerged its dock and gangway, and the hotel, restaurant and bar were closed to the public. Chattanooga Mayor Andy Berke pushed to have the empty hotel removed for obstructing the view. Now, the U.S. Congress may finally allow the Delta Queen to again ply the Mississippi, Ohio, Tennessee rivers and carry overnight passengers. The U.S. Senate voted 85-12 on April 3 to approve legislation that would exempt the Delta Queen from federal safety regulations that had forced it to dock. The bill would exempt the historic steamship from the Safety at Sea Act. The act, which passed in 1966, prohibits passenger vessels with rooms for 50 or more people from plying the waters unless those vessels are made of fire-retardant materials. Much of the steamboat, completed in 1927, is made of wood. For decades, Congress periodically approved exemptions so the Delta Queen could continue carrying passengers along the Mississippi. The last exemption ran out in 2008. The ship's boosters, including members of the Delta Grassroots Caucus, have been lobbying for a new exemption ever since. "We've been working on this for many years, so this is a great day for supporters of the Delta Queen," said caucus Director Lee Powell. Now the legislation heads to the U.S. House of Representatives, which passed similar legislation in 2013 only to see it die in the Senate. Cornel Martin, the president and chief executive officer of Delta Queen Steamboat Co., said he's hopeful that the bill will clear both houses of Congress and be signed into law this year by President Donald Trump. "We're feeling pretty confident. If we're able to get the legislation done before the summer or early summer at least, she should [be] cruising again in the spring of 2018," Martin said. "We've been working it very hard. The legislative process is cumbersome. It's not easy." If Congress lets the Delta Queen carry passengers again, the vessel will undergo a multimillion-dollar renovation, Martin said. Since buying the ship and taking it to Louisiana, Martin has traveled repeatedly to Washington, urging lawmakers to intervene. Senate Bill 89, which passed April 3, would require the Delta Queen to have up-to-date boilers and engines inside enclosures with fire suppression systems. And the Delta Queen would need to make annual structural alterations to at least 10 percent of the areas of the vessel that isn't constructed of fire-retardant materials. The Delta Queen would make the alterations, Martin said, by replacing wooden parts that passengers can't see. For example, the wood paneling inside the ship would be saved, but the wood supports behind the paneling would be replaced — sort of like replacing the 2 by 4 wood studs in a house with steel 2 by 4s. "About 20 percent of the vessel right now is made of wood," Martin said. Kimmswick, Mo., a tourist town of about 158 residents on the Mississippi River half an hour's drive from St. Louis, was selected in September 2015 as the new home port for the Delta Queen. 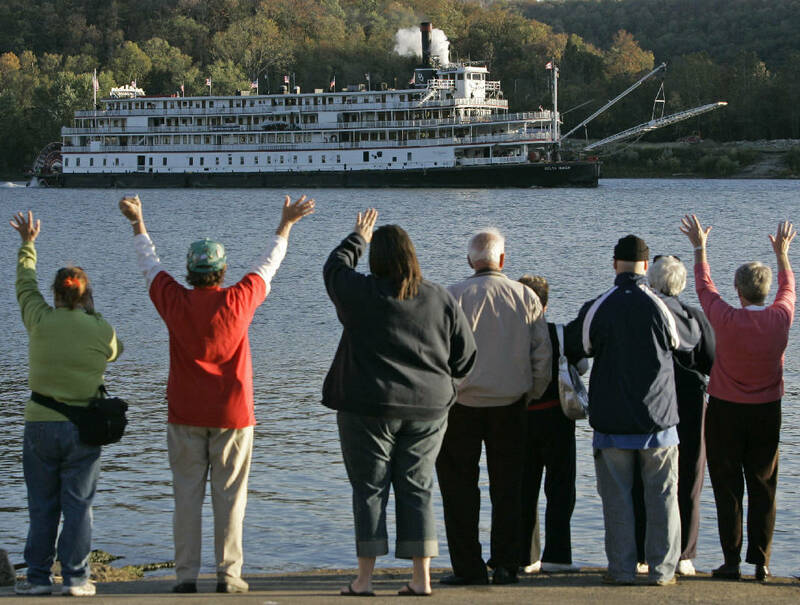 The old paddle-wheel steamboat is slated to carry passengers on overnight trips to more than more than 80 ports, including New Orleans, Nashville, Tenn., and Pittsburgh, Penn. Basing the Delta Queen in Kimmswick would create more than 170 jobs and bring in more than $36.4 million annually to the St. Louis region, the Delta Queen's owners and officials in Missouri said when Kimmswick was chosen. "It will be a huge economic boom to the city of Kimmswick and general Jefferson County area," said Kimmswick's Mayor Phil Stang. Stang said Congress may set the Delta Queen free after all these years because it's got the backing, this time, and because the law calls for reducing the steamship's wooden parts. "We got the right people to push it forward," Stang said. "The other piece of it as part of the bill there is a commitment over the course of the years to upgrade." The ship has been listed as a National Historic Landmark since 1989. U.S. Rep. Rick Crawford, a Republican from Jonesboro, Ark., whose district borders the Mississippi River, predicted the steamboat will get its exemption this time. "I have confidence that the House will pass the Delta Queen bill, and we will see her cruising on America's major waterways once again," he said in a written statement. If the Delta Queen exemption becomes law, ticket buyers would have to be informed, in writing, that the ship "does not comply with applicable fire safety standards due primarily to the wooden construction of passenger berthing areas." Signs would be posted throughout the vessel warning those on board that it "fails to comply with safety rules and regulations of the U.S. Coast Guard." In October, the National Trust for Historic Preservation placed the Delta Queen on its annual list of America's 11 Most Endangered Historic Places. The organization had urged people to support the bill. Nancy Tinker, a senior field officer with the Washington-based nonprofit group, said the recent Senate vote is an important step in the battle to save the Delta Queen. 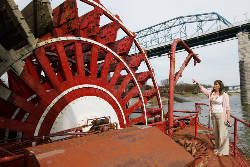 "She's the last vessel of her type, the last river-going, steam-powered vessel to provide overnight passenger service. She represents the last vestige of a uniquely American maritime past," Tinker said. Using the Delta Queen as a boutique hotel in Chattanooga was "a very good stopgap measure [but] it was not a use that could be sustained over the long term," Tinker said. "She was designed to move, she was designed to plow the American river system, and that's the best way to assure a sustainable future," she added. When the steamboat starts to cruise again, it eventually will make stop in Chattanooga, Martin said. "Absolutely," he said. "Chattanooga always has been a will be part of her itinerary." Contact staff writer Tim Omarzu at tomarzu@timesfreepress.com or www.facebook.com/MeetsForBusiness or on Twitter @meetforbusiness or 423-757-6651.